PM Update (Sunday): An additional 0.08" of accumulation from showers overnight pushed the March total to 1.97", and the 2-month total to 2.32". 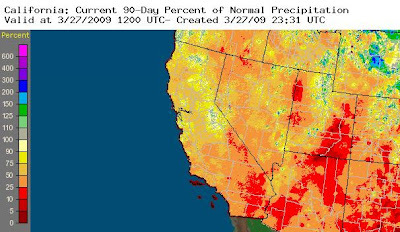 If no more precipitation falls through Tuesday, the old February-March record will have held by a mere 0.03", and 2009 will be firmly in second place. With another half inch of rain recorded so far today, the Washington, DC total for the month of March to date is now 1.89". This puts the February-March total at 2.24", slightly below the record low amount of 2.29" in 1947. With more showers likely tonight and Sunday, the record will almost certainly remain intact. 11 pm Update: The latest observed value at 9:15 pm CDT is 40.79 ft. 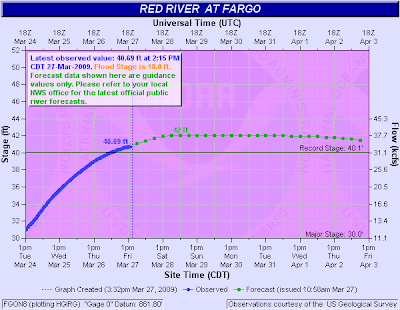 The latest observed stage of 40.69 ft. at 2:15 pm CDT on the Red River at Fargo, ND exceeds the record stage by over half a foot. Levels are forecast to crest at 42 to possibly 43 ft. and remain above the previous record through next week. CapitalClimate comments at Climate Progress on the subject of Red River flooding. 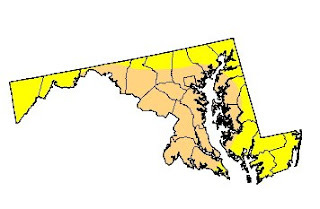 As light rain showers continue in the area this afternoon, the weekly U.S. Drought Monitor shows nearly all of Virginia, DC, and Maryland in at least the Abnormally Dry category. 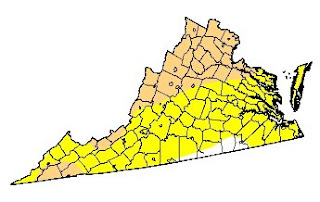 Moderate drought (tan shading) covers 32% of Virginia and extends northward through 52% of Maryland. 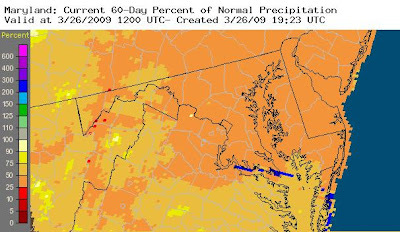 For the last 60 days, precipitation has been only 25-50% of average from northern Virginia across Maryland and Delaware, and into New Jersey and Pennsylvania. Through 5 pm today, 0.26" of rain has been measured at Washington National Airport, bringing the month's total over 1" for the first time. At 1.13" to date, this month has now dropped to the 7th driest March. 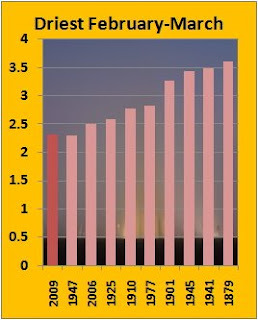 Dulles has reported 0.30" for the day and 1.14" for the month; at BWI the daily and monthly amounts are 0.22" and 1.02". Although today's rain is nearing an end this evening, there are a couple more chances of precipitation before the end of this month. Unchecked future greenhouse gas emissions, particularly of carbon dioxide from the burning of fossil fuels, will almost certainly lead to additional climate impacts such as further global warming, continued sea level rise, greater rainfall intensity, more serious and pervasive droughts, enhanced heat stress episodes, ocean acidification, and the disruption of many biological systems. The resulting inundation of coastal areas, severe weather impacts, and loss of ecosystem services will likely cause major negative impacts for most nations. Geoengineering could conceivably offer targeted and fast-acting options to reduce acute climate impacts and provide strategies of last resort if abrupt, catastrophic, or otherwise unacceptable climate change impacts become unavoidable by other means. However, geoengineering must be viewed with great caution because manipulating the Earth system is almost certain to trigger some adverse and unpredictable consequences. Furthermore, these impacts would almost certainly be distributed unevenly among nations and people, raising serious ethical issues. Research to date has not determined that there are large-scale geoengineering approaches for which the benefits would substantially outweigh the detriments. Enhanced research on the scientific and technological potential for geoengineering the climate system, including research on the unintended as well as intended environmental responses. Additional study of the historical, ethical, legal, political, and societal aspects of the geoengineering issues. Members of the AMS may submit comments on the proposed statement until April 23.